This particular installation took place in the Hull area of Yorkshire at our customers home address. 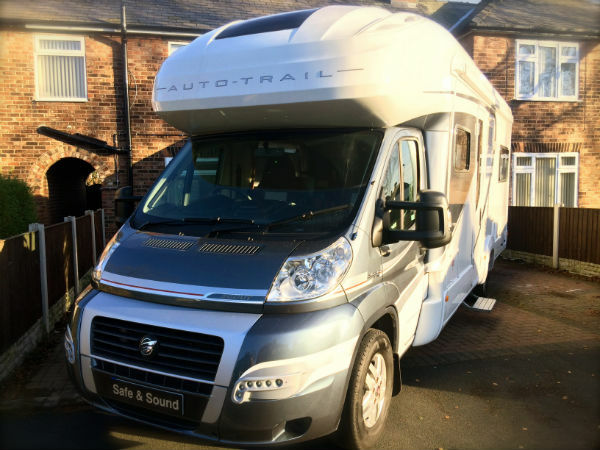 The vehicle was an Autotrail motorhome based on the popular 2013 Euro 5 Fiat Ducato. The products we installed were our ultimate motorhome alarm and the Smartrack protecter Pro tracker. The brilliance of these two products when installed together is the ability to link the motorhome alarm to the tracker. This means that should an alarm condition occur the tracker will alert the 24 hour monitoring centre who will in turn contact the owner to inform them of the alarm condition. The Smartrack Protecter installed to the motorhome also boasts a very useful smartphone app which allows the owner to have an on demand location of the vehicle, at any time, anywhere in the world. We believe both the alarm and tracker once fitted to any Motorhome offer the very best level of protection and great peace of mind for proud motorhome owners. The alarm is operated through the original fiat remote key. As Fiat only supply one remote key we supplied an additional remote fob which now operates the vehicles central locking and also folds in the habitation door side step. Additional wireless contact sensors were installed to protect both rear garage doors and the habitation door against break-in. An internal PIR sensor was installed inside the habitation area to protect against intrusion via the habitation windows. Installed an insurance approved category 6 Motorhome Tracker. The tracker will alert the owner if the alarm is triggered. The vehicle can be located from the Smartrack smartphone app. Both the insurance approved motorhome alarm and insurance approved motorhome tracker come complete with a manufacturer backed 3 year warranty. If you would like to enquire about securing your motorhome then please feel free to contact us. We cover a large area of Yorkshire carrying out installations to motorhomes at locations to suit you daily. We look forward to hearing from you.